There have been quite a few Wizards/ Bullets players who have hit the 50 point mark in a game, however the result wasn’t a loss to a just okay Magic team who used a fourth quarter push to finish off the 52 point effort of John Wall and make it all for nothing. Wall had the highest-scoring game of his career and kept Washington in it with 33 points in the second half as the Wizards cut the lead below 10 in the fourth quarter. The guard made 18 of 31 from the field and added eight assists. Wall has also been calling on the media tell his players he needs help. That’s strange, we thought you had the help of your team, well okay the starters yes, that bench, well not so much that’s for sure. Lets summarize, 22 points by you bench in the NBA, wins how many games? zero to none. That is exactly where the problem lies that Bradley Beal’s 19 points just wasn’t enough for Frank Vogel’s squad late in the game. 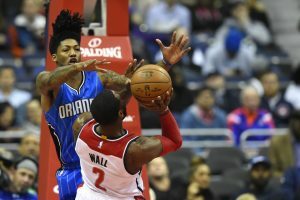 For Orlando, young players like Elfrid Payton. who dropped a career high 25 points tonight, 22 of them coming in the first half to help the Magic improve to 10-13 on the season. The Wizards continue their home stretch on Thursday night against the Nuggets.